You too can live the good life on pennies! For a classically vintage gal like me who has attended dinner and a can-can at the Moulin Rouge in Paris, dinner and a movie star at Stage West in Calgary and dinner and an aria at the Pan Pacific Hotel, I had my 4″ Steve Madden stilettos on faster than Lindsay Lohan could lay her hands on her next “get out of jail free” card when I received an invitation to attend dinner and a swoon at Federico’s Supper Club during Dine Out 2013. More than just an opportunity to take advantage of a prix fixe menu at many restaurants that seldom offer one, Dine Out can sometimes be a hurried affair when restaurants not only enforce a time limit of an hour and a half in an effort to increase profits at the expense of the diner’s enjoyment, but unintentionally also cut corners in the quality of the food. And then there’s Dine Out at Federico’s Supper Club where not only do you have a choice of a 3 or four-course dinner, but if you make a reservation after 7pm, you can enjoy your meal at a leisurely pace while being entertained by world class entertainers such as Blues Legend, Wes Mackey or even Federico Fuoco himself, who not only owns Federico’s Supper Club but whose charismatic presence and extraordinary talent has earned him the title of “Knight of Clubs” by the Globe and Mail and the privilege to open for Italian artists – Umberto Tozzi, Albano and Romina Power and Massimo Ranieri. To begin our most enchanted evening, guitarist, Sandro Camerin performed soft easy listening music to softly ease us into the enticing night ahead while we perused the extensive menu. The $38 menu consists of an appetizer, entrée and dessert while the $48 menu allows you to add a pasta dish with each category offering you an extensive choice of 5 or 6 selections. Most Dine Out menus only offers you 3 choices which can prove to be detrimental to people who have food allergies such as lactose intolerant me. Wine pairings are optional and are Mission Hill VQA wines. My friend, Rick Green (@BCBrews) and I opted for the four course meal with wine pairings, but had I known the portions would be Italian-sized (ginormous), I would have chosen the three course dinner or worn elastic waisted pants. Antipasto Assortito (gluten-free): assorted cured meats, select cheese, olives, eggplant rotolo, house pickled peppers, seafood feature, sauteed organic mushrooms. 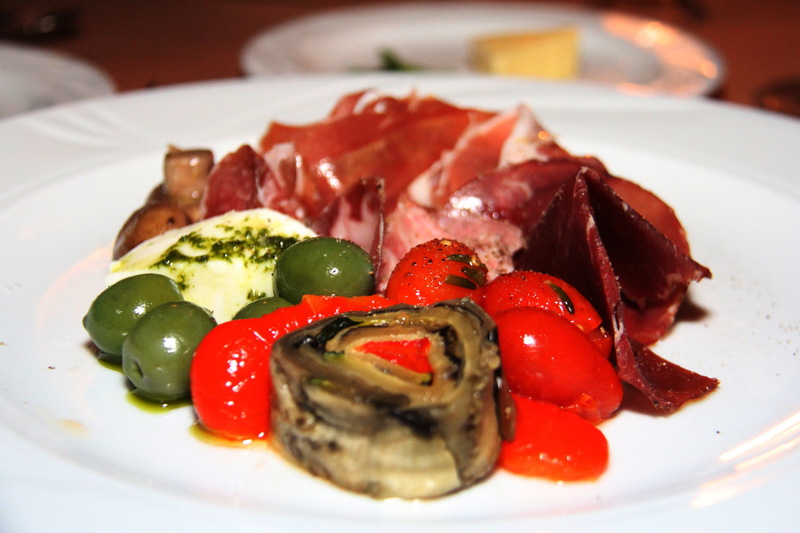 This is a delightful assortment of roasted peppers, artichokes and cured meats to start the meal as its just perfect with the fresh bread. 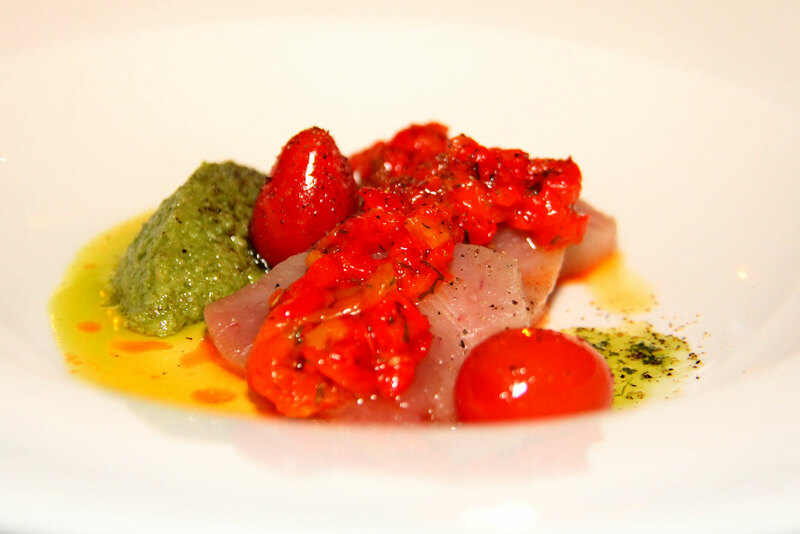 Carpaccio di Tonno: Albacore tuna carpaccio, roasted peppers, dill, basil oil. When I see the word carpaccio on a menu, I see images of thin slices of meat, so I wasn’t prepared to be presented what appeared to be sashimi. Smooth, buttery and more tender than any albacore tuna I’ve had, it was more like toro. Served with pesto, fresh red pepper sauce and basil oil, it was a refreshing change from the usual spicy wasabi with salty soy sauce as it seemed to highlight the taste of the fish more. I was a bit taken back that an Italian inspired restaurant would serve such high quality sashimi, but was informed that one of Chef Nick’s mentor at his former restaurant Lupo, was Chef Takeo. Paired Wine: Mission Hill Five Vineyard Sauvignon Blanc: This wine had the perfect amount of minerality with crisp undertones of lemon and grass which didn’t overpower the fish. 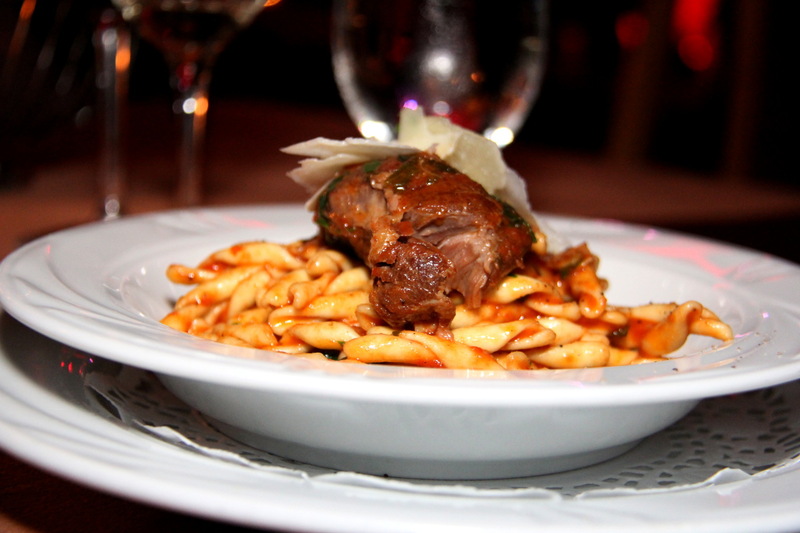 Strozzapreti: twisted pasta in the style of Amatriciana, braised pork cheek in tomatoes and shaved pecorino. Like most typical girls trying not to watch their girlish figures balloon after Christmas, I tend to avoid carbs but I couldn’t resist ordering this as I find pasta that is spiraled in shape has more surface area to absorb sauce. And as I suspected, the pasta was cooked al dente with the perfect amount of sauce, underneath a perfect mound of pork that is braised in wine and cooked so tender with spices and a little bit of heat to the sauce. Although I still had an entrée and dessert coming, I couldn’t stop eating this. This is such a big portion that you could just order this with dessert and nothing else. Wine pairing: Mission Hill Cabernet Sauvignon – full bodied, full of plump cherries and plums, it’s the perfect wine to go with any meat. 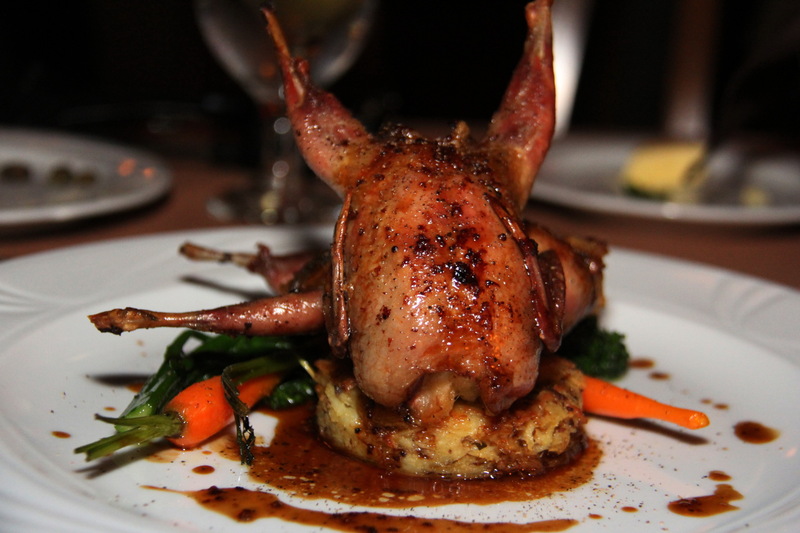 Quaglia Arrostita al Forno: oven roasted quail, stuffed with brioche and fontina cheese, potato rosti, Dijon demi. I call this Bye Bye Birdie as it seemed to fly pretty fast into Rick’s mouth. Because I’m lactose intolerant, I only had a nibble and from what I had, it was tasty and the skin had a nice crispy exterior. 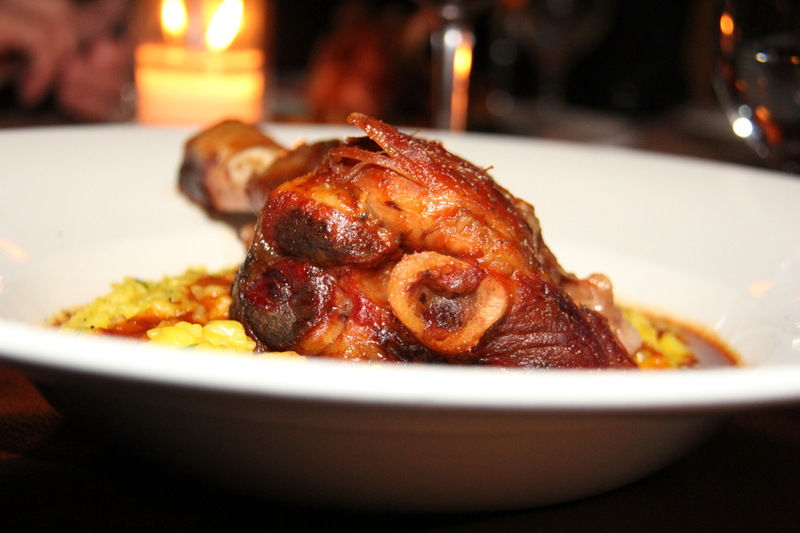 Agnello Brasato (gluten free): slow cooked lamb shank in a tomato, red wine and cinnamon, risotto Milanese. I adore lamb and every time I see it on the menu of an Italian restaurant, I usually can’t resist ordering it as Italians always seem to cook lamb with the right spices, marinade and the right tenderness until its moist but never dry. But when this arrived at our table, I think my eyes popped out of my head as this is a hugemonous portion of lamb shank and doesn’t disappoint. Lamb shank doesn’t get any better than this. Again another winning dish that could very easily be a share dish for two. Wine pairing was also Mission Hill Cabernet Sauvignon. 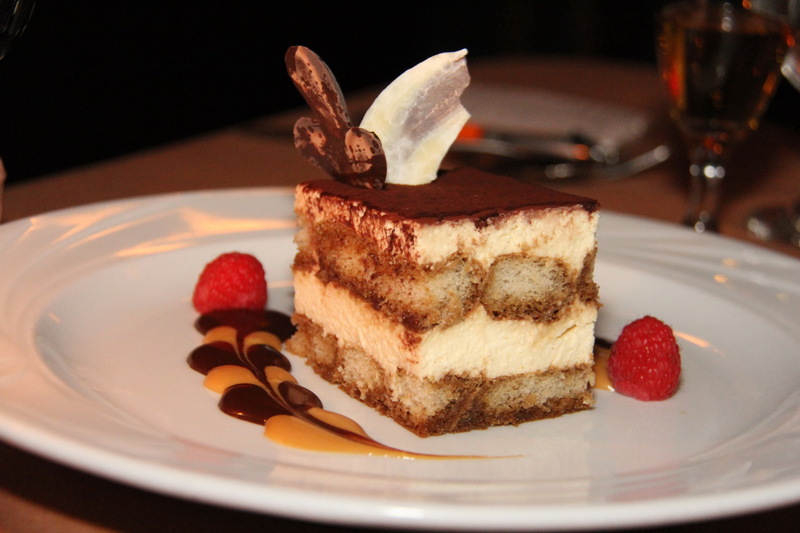 Tiramisu: layered espresso dipped lady fingers, mascarpone cheese mousse. Back in the day when I could eat dairy, this was my favorite dessert to make except that my version is so alcohol-enhanced that you can smell it coming. I had a teensy-weensy bite of this and loved that there was chocolate and caramel sauce on the side to enhance the silky richness of the mascarpone cheese. 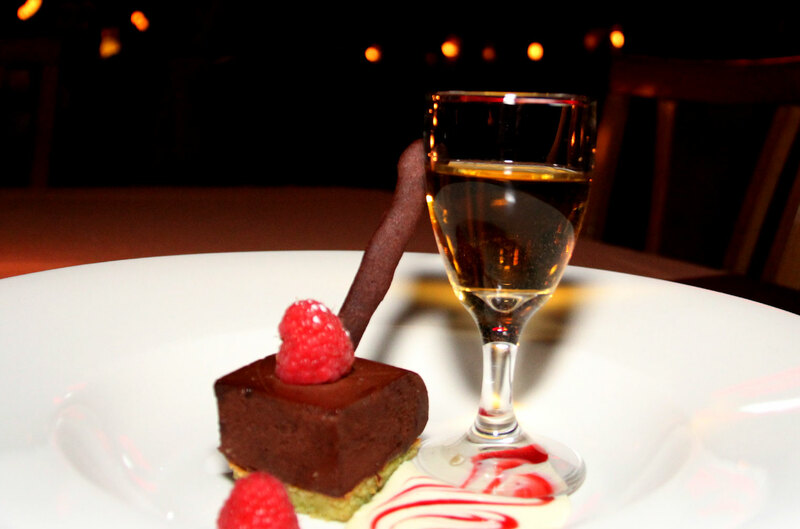 Marquise al cioccolato (gluten free): chocolate pate, port wine, fresh berries. By this point of the meal, I think I gained ten pounds so I could only have a few bites. It’s rich dark chocolate ganache with an oatmeal crust that satisfies anyone’s sweet tooth ten times over. Because it is so dense and rich, I’m glad they didn’t serve me a portion bigger than a few bitefuls. Wine pairing: Mission Hill Vidal Ice Wine. Sweet with undertones of apple, it’s the perfect way to end a meal and goes down rather too easy. Non ci è fine. Non ci è inizio. C’è solo la passione di vita. No DJ playing hip hop music or night club spinning old disco tunes can compare to live entertainment as it sets a mood, vibe and energy that is contagious and hard to resist. In the case of the dynamic duo of Federico Fuoco and Palma D’Andrea, diners were soon enticed to the dance floor to dance to songs such as “Sweet Caroline”, “Locomotion”, “Billie Jean” and “I Gotta Feeling”. And oh yes, I was out there with my 4” stilettos proving that my funk bone was connected to my hip bone. My favorite part of the entertainment though were the legendary classics such as “It’s Amore”, “It’s Now or Never” and “Fools Rush In” sung by Federico in his suave demeanor that made me weak in the knees as it reminded me of a time and place when chivalry was alive and thriving, and men were men and passion for life was not an occasional evening out on the town, but a way of life. From Wednesday to Thursday, Federico’s offers a $9 pasta special with 50% off before 7pm. 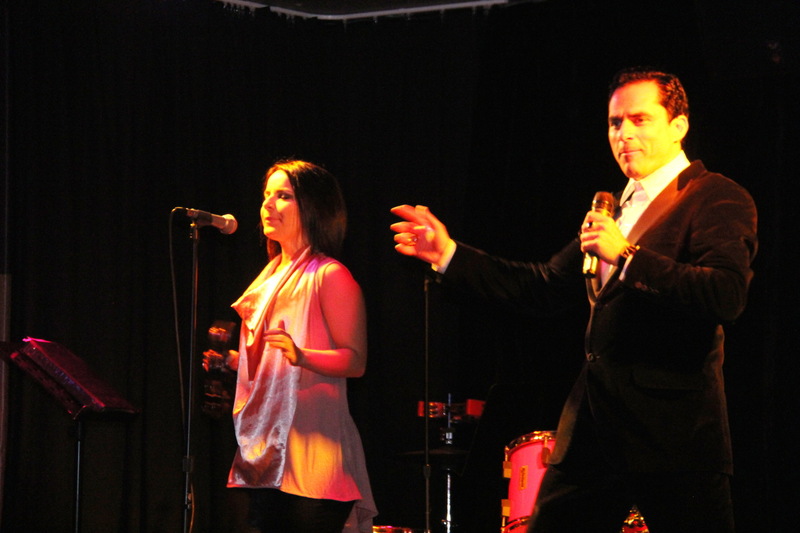 Live music and dinner is offered 5 nights a week, Wednesday to Sunday, with a range of genres from crooner, legendary favourites, dance hits, blues/jazz, Italian and Latin. Federico Fuoco and Palma D’Andrea perform Sunday to Thursday. Live music on Friday and Saturday evenings consists of guitarist, Sandro Camerin performing during dinner from 8pm to 10pm and at 1030pm, Federico takes center stage along with Shannon Green for high energy dance music. An A La Carte menu is available on Wednesday, Thursday and Sunday evenings with !Pasta Hour! every Wednesday and Thursday, between 530pm – 7pm, featuring $9 authentic pasta dishes, paired with 50% off select wines by the bottle and glass. On Friday and Saturday evenings, Federico’s offers their Supper Club Menu – a fixed price, 3 or 4 course menu with multiple options within each course. This menu is available for groups up to 10 guests. Buon Appetito! Recent reviews by Dianne C.